Here are some simple Summer recipes passed on to me from Margaret, easy and delicious. Combine melon and tomatoes in large bowl. Sprinkle with 1 teaspoon fleur de sel and toss to blend; let stand 15 minutes. Add 4 tablespoons oil, vinegar, and herbs to melon mixture. Season to taste with pepper and more salt, if desired. Toss arugula in medium bowl with remaining 1 tablespoon oil. Divide arugula among plates. 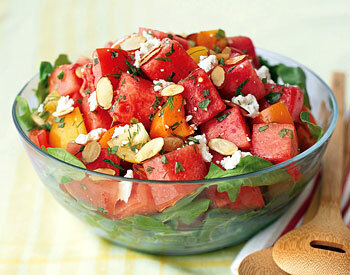 Top with melon salad; sprinkle with feta cheese and toasted almonds and serve. Process beans in processor until smooth. Stir in pesto. Fold in spinach. Add lemon juice to taste. Calories 160; Fat 8g; Saturated Fat 2g; Cholesterol 5mg. Sodium 330mg; Carbohydrate Fiber 4g; Protein 7g; Calcium 180mg. and in a bowl mash coarse with a potato masher or fork. Stir in yogurt, scallions, and salt and pepper to taste. To prepare pita toasts: Preheat oven to 350’F. This entry was posted in Recipes, Summer 2012, Uncategorized and tagged Recipes. Bookmark the permalink.